Looking for a new spin on the traditional turkey? Here, some ideas to inspire you — plus some tips for preparing a lighter feast. Long cooking times and dried out white meat are issues that plague the popular baking method. The solution: take the bird apart. Disassembling and cooking a turkey in three parts (breast portion and two legs) cuts down on overall cooking time (to as little as two and a half hours) while ensuring that both the white and dark meat are cooked to perfection. This method is also compatible for variations on the traditional roast, such as bacon-wrapped or vegetable, popcorn or fruit-stuffed versions. Where to find the technique: Julia Child’s cookbook The Way to Cook tackles the stuffing and provides helpful illustrations on how to disassemble and de-bone. With her technique, the legs are removed, partially de-boned and stored in the fridge until the last hour and a half or so of cooking. What about the final presentation? Skipping the carving ritual and serve the meat on platters or “buffet style” — no one will know the difference. Otherwise, you can use bamboo skewers to put it back together again and garnish with parsley as camouflage. An added bonus: If you have a family member who loves to grill, you can share the workload. Fans of this process say it’s the ultimate way to prepare a turkey, and it’s much cheaper to do-it-yourself. You won’t need any fancy recipes — it’s the smoke that gives it the flavour. Instead of a roasting pan, you’ll need a smoker and some hardwood like cherry, apple or mesquite. You’ll also need a sheltered area to shield against the wind and a good meat thermometer. The process isn’t as fast as other preparation methods — it takes about 40 minutes per pound (that’s eight hours for a 12 pound bird). 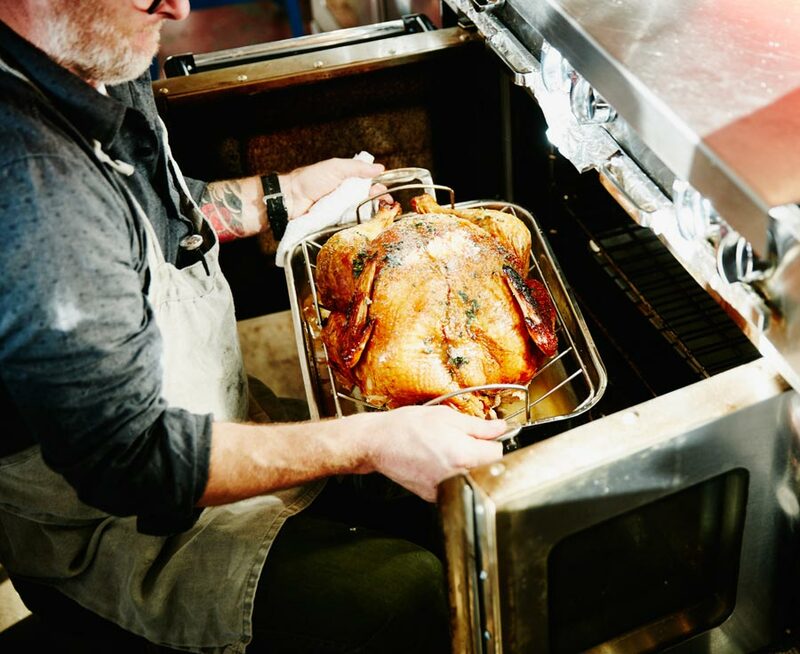 The turkey is cooked at a low temperature (between 220 degrees F and 240 degrees F) until it reaches an internal temperature of 165 degrees F. A little hourly attention is needed to replenish the fuel and water (for water smokers), and you’ll want to skip the stuffing altogether for health and gustatory reasons. In the end, the colour and texture will be a little different than your traditional baked turkey. A word of caution: due to the low heat and required cooking time, keep your turkey a reasonable size (16 pounds or less) to avoid any health risks like cross-contamination. It sounds fattening, but this Southern cooking tradition doesn’t add as much fat as you think if it’s done properly. Keep the oil at the right temperature and you’ll get a nice crispy skin and tender meat with about two grams of fat added per serving. However, if the temperature of the oil drops below 350 F, more oil seeps into the meat and raises the fat content. Deep-frying is a quick process that requires as little as three minutes cooking time per pound. However, it can be a dangerous one, especially if there are children and pets around. You’ll be dealing with a lot of hot oil (four or five gallons or 17 litres worth) and a large-sized cooker. Constant supervision is required so you’ll need a dedicated person (and possibly a second set of hands) for the job — someone who isn’t preparing other food, entertaining the guests or drinking. The right equipment and safety precautions are a must. A frozen, partially thawed or wet turkey can cause an oil overflow and fire. You’ll also need to cook outside, and stay at least 10 feet from anything that can catch fire. Pets and children should be kept well away, even after the turkey is done because the oil remains dangerously hot. Pots can tip over or overflow and catch fire, so keep a fire extinguisher handy. Never heard the term? Picture a partially deboned turkey stuffed with a deboned duck that is stuffed with a deboned chicken. And did we mention the layers of stuffing in between? The turducken offers a little something for everyone, and it looks impressive when sliced. While this dish isn’t difficult to make, it isn’t quick or inexpensive either. Deboning the meat may take a while if you’re not experienced and don’t have the right tools, but a butcher can perform this service for you if you’re willing to pay. You won’t actually be trying to stuff a whole bird into another one — the birds are cut open along the bottom so that they can be laid flat and layered with different types of stuffing. Skewers are used to “sew up” the birds to make the whole concoction look like a turkey on the outside. You can also skip the prep and order a pre-made turducken through a mail order service or specialty shop, but expect to pay between $85 and $135 — prices can run as high as $13.99 per pound. Plan for lots of prep time and a baking time of 4-7 hours (depending on the size), and add on a half hour of rest time before carving. No sacrifices required. The trick is to find a turkey that doesn’t have any wheat-based proteins or other risky chemicals added to it. Prepare your own gravy rather than using a mix or “helper”, and use gluten-free bread in the stuffing (made from scratch). For more information about preparing gluten-free foods, see the Canadian Celiac Association website. This popular prep technique involves submerging your bird in a brine of salt or salt and brown sugar. You’ll need plenty of space and time for this one — including a container large enough to hold the turkey and the brine (like a large cooler) and a place to keep it cold for a long period of time. A basic brine combines about 1/2 to 1 cup of salt per 1 gallon of water, depending on whether you use sea salt or regular table salt. Expect to use up to 4 gallons of water for 25 Ib turkey. Dissolve the salt completely and then pour over the turkey. Let the turkey rest submerged in the brine for 1 hour per pound. (For example, a 15 Ib turkey should sit for 15 hours.) When in doubt, experts say it’s better to take it out early than leave it in too long. Techniques vary depending on what recipe you use, and you can dress up the brine with some spices for some extra kick. Once the turkey has had a good soak, it can be roasted, smoked or barbequed. Is there a low-fat or “lite” way to prepare a turkey? Most cooking methods don’t add additional fat or calories (the stuffing recipe is another story). Exercising some portion control and skipping the skin are the best ways to keep the calories and fat content to a minimum. If you’re looking to keep the meal light, focus on the side dishes and dessert. Try roasted or steamed vegetables instead of casseroles or heavy sauces. Try a fruit crisp or crumble for dessert instead of a pie or cake, and serve it a la mode with frozen yoghurt. And if you want to go low-carb, look for recipes that use fruits and vegetables to stuff the turkey rather than a bread-based stuffing. Try mashed cauliflower instead of mashed potatoes, and skip the rolls. How much do you need? Some techniques take longer than others and aren’t suitable for turkeys larger than 12-16 pounds. Will you have help? Sometimes a second set of hands is required because the turkey must be cooked outdoors or needs constant supervision. What equipment do you need? Some specialized items may be required, including deboning knives, smokers or deep-fryers. How much time do you have? Slower cooking methods and lots of prep may not be compatible for lunchtime or early afternoon meals. Do you like your stuffing cooked separately? Stove-top or baked stuffing recipes are always an option, but they may be a requirement for some methods due to food safety concerns.